I decided to do a porch shoot today, even though the rain has returned. A couple of painting projects I've been waiting to work on, are now inside projects! Yesterday I got a couple pieces started, and this one finished. 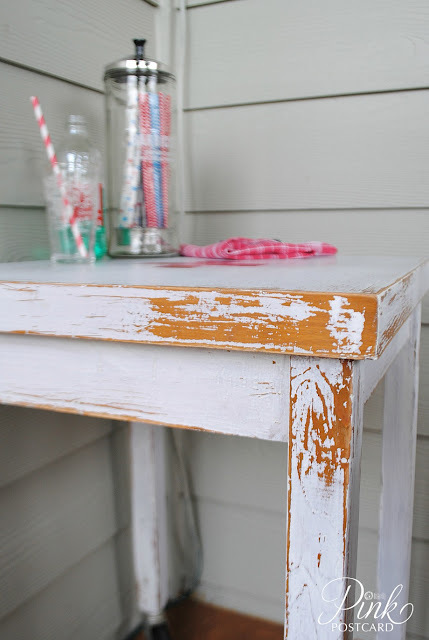 This little industrial table was pretty plain jane to begin with. I always love functional, sturdy pieces. I gave it two coats of Miss Mustard Seed's Ironstone. I did a similar table this past January, and really loved it. It sold pretty quickly at Junk Salvation. 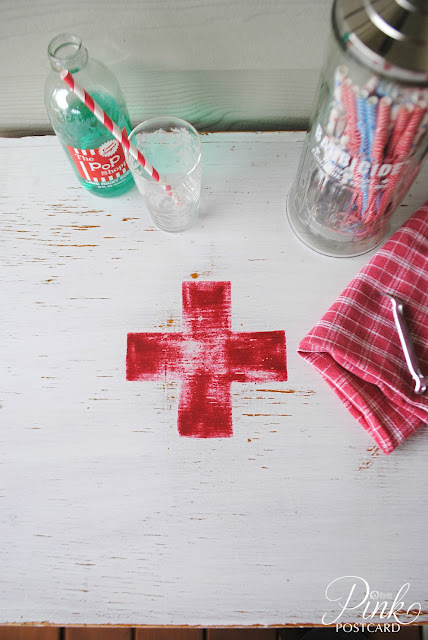 I painted a red cross on the top, and distressed it, then waxed the whole piece. I also just got in an order of fun straws for Memorial Day and Fourth of July! I sell packs of stripey straws at my space at Aunt Bee's, and thought they looked great with the table. 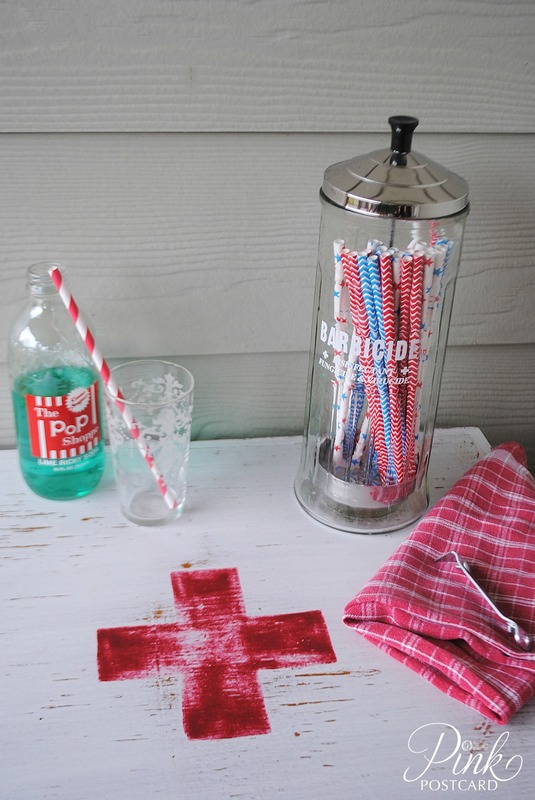 The Barbicide dispenser is something I picked up a few weeks ago on one of my shopping trips. I had planned to put it in the Farmhouse Show, but I decided I liked it too much to let it go. Formerly used in barber shops to sterilize combs, it's now cleaned up and a fun straw dispenser at our coffee / Italian soda station. hanging a salvage window frame I picked up for the front porch. 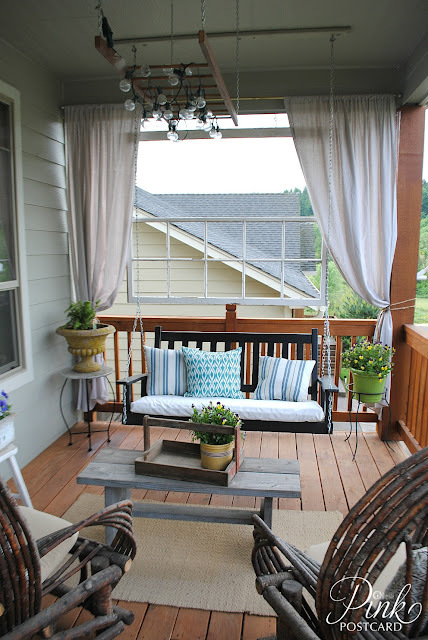 Last year when I wrote this post, I mentioned I'd love to find a salvage window frame to hang behind the swing to draw your eye forward- away from the neighbors roofline. It had all the glass still in the panes, so we had a smash fest and broke glass in the driveway! It took a bit longer than I anticipated, because there were lots of shards wedged into the frame after the big pieces were broken. But now, it's hung and I love it. 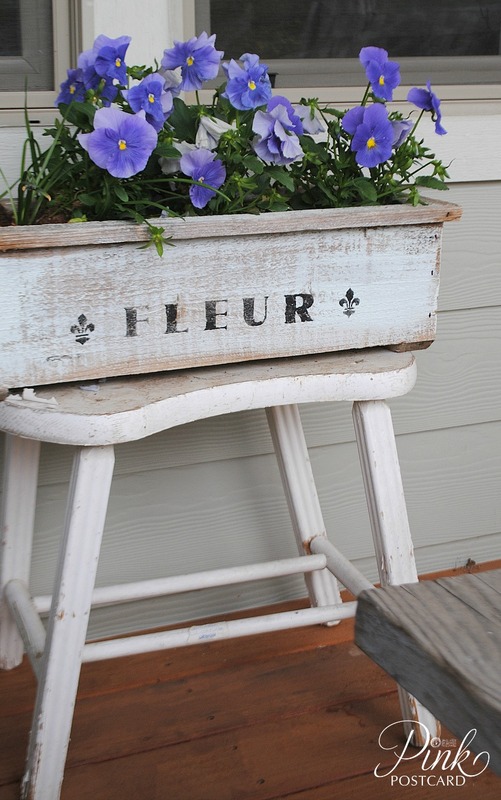 Just another charming element to the porch. We've had a lot of time to already enjoy the porch. It's unusual- normally Spring time in Oregon is chilly and drizzly. But we've had temperatures in the 80's for a nice long stretch. Perfect for enjoying the flowers and a nice glass of wine. I'm gearing up for summer items at Aunt Bee's House, so this will fit in perfectly with the Americana pieces I will be taking in soon. I'm going to continue working on the other piece, and finishing up a large armoire. You can also see what I do to keep busy during the day by following my Instagram feed! That little table is very CUTE and I love that huge window on your porch (perfect for that spot). Adorable, Denise! Love your porch window too! visiting from feathered nest friday. THis is spectacular. Love love the table. the window frame idea is pretty cool too. I really love your porch. The window frame looks great behind the swing, what a great addition. 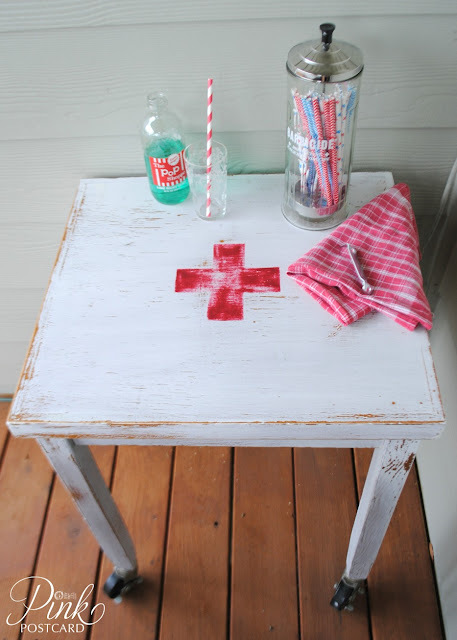 I like your little Red Cross table, nice find. Your porch is such a pretty place--love the window and everything you have done. Those straws are so cute! Love your sweet little table! 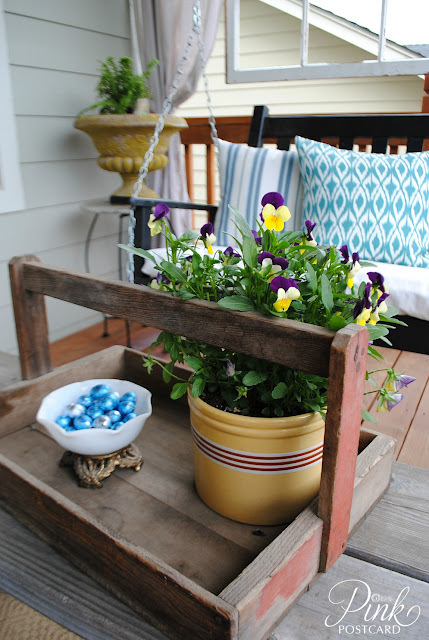 Your whole porch looks so beautiful!! 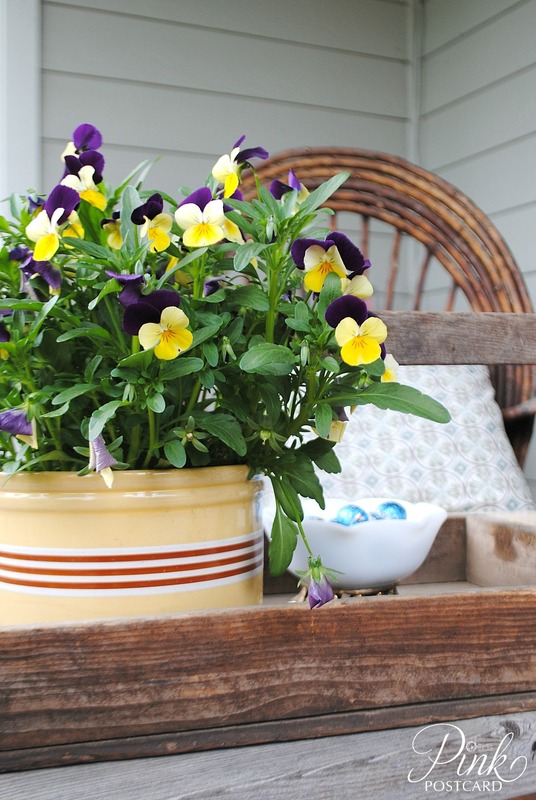 I love your porch! Perfect! Okay, I love the red cross table. Totally my style. It's very cute, and a bit creepy at the same time. Looks like it could be a prop in an old horror movie and that's a compliment! Love the red cross! Cute little detail! I have to work on my porch this weekend. it still looks glum and post-winter. Your porch shots are just the inspiration I need! This is a great table and the front porch looks great! Have a great weekend. Just coming by again to let you know that you will be featured at my party on Monday. Love the red cross symbol, great work.